The airline today announced an order for 40 A330-900 aircraft, and 30 A350-900 aircraft, in a heads of agreement signed with Airbus. The deal is worth US$ 21.4 billion at list prices. But it also announced that it will only take 14 more A380s eliminating 39 A380s from its order book. The airline will receive 14 more A380s from 2019 until the end of 2021, taking its total A380 order book to 123 units. Some of these frames will replace early generation A380s that are coming to the end of their lease terms. 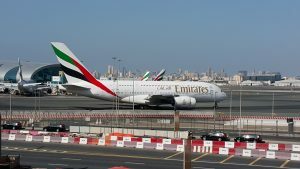 The A380 program really has only survived because of Emirates. There are a handful of other operators with small fleets of the airliner. For passengers it is a fine aircraft. But it really was designed to operate solely between major hubs. Flying the A380 on secondary routes is unlikely to have been profitable despite the interest generated. The A380 is expected to remain in the EK fleet well into the 2030s. The 40 A330neos and 30 A350s give Emirates an operating flexibility that the A380/B777 failed to do. The A330neos will be deployed on Emirates’ regional destinations, and also enable the airline to serve smaller airports and thereby open new routes and connectivity for its global network. The A350s will supplement Emirates’ long-haul operations, providing the carrier with added flexibility in terms of capacity deployment on 8 to 12 hour missions from its Dubai hub. The A350 is a nice airliner for passengers who will welcome it into the Ek fleet giving a greater comfort in the back of the airliner than in any of its 777s. What this means for the Boeing 787 – back in November 2017 the airline announced a US$ 15.1 billion (AED 55.4 billion) commitment for 40 Boeing 787-10 Dreamliners. It was a letter of intent rather than a firm order and it may be that the mixed Airbus fleet replaces the requirement for the 787.